Greg and Krysten Magnuson are an American husband and wife duo who play drums and guitars live, swapping readily between the two, while splitting vocal duties evenly. They both have a passion for Metal, citing Metallica, Mastadon, Opeth and Meshuggah as musical heroes, whilst other two-piece acts such as The White Stripes are regarded as inspirational. 'Discordia' was recorded over two years in Space Fire Studio, situated in their home, and was produced by Greg Magnuson and self-financed. 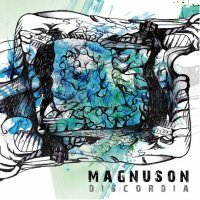 Due to the fact Magnuson are a duo, comparisons to TWS will be inevitable, but the music on 'Discordia' is very different. It is essentially Rock/Metal and there are chord progressions within the music that border (only just) on Progressive Metal. The female/male vocals work well together and give the material a dimension that would have been missing had it just been Greg or Krysten Magnuson singing. Krysten Magnuson has a hint of Cristina Scabbia (Lacuna Coil) in her delivery but occasionally Greg Magnuson's tone drifts into a monotonous Morrissey direction (only occasionally) that I try to block out. The playing is accomplished without being self-indulgent and the production values for a low-budget release are quite good. I would have liked to have heard some bass to give the music more depth and I think the use of keyboards would have added more warmth to the sound; just guitar and drums can be quite clinical and may also become restrictive when writing. At thirteen tracks it is also three too many. A lot of the songs have a similar style, tempo and structure, so identity and distinction gets lost in the flow. It is not a wholly unique concept but Magnuson are more appealing, in my opinion, to TWS and I'm sure the songs on 'Discordia' will make for an entertaining live experience.